■ Compare renewable and nonrenewable resources. ■ List uses of fossil fuels. ■ Identify alternatives to fossil fuel use. Wise use of natural resources is important for the health of all life on Earth. An earthworm burrowing in moist soil eats decaying plant material. A robin catches the worm and flies to a tree. The leaves of the tree use sunlight during photosynthesis. Leaves fall to the ground, decay, and perhaps become an earthworm's meal. 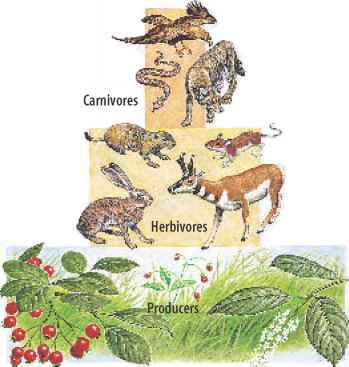 What do these living things have in common? They rely on Earth's natural resources—the parts of the environment that are useful or necessary for the survival of living organisms. What kinds of natural resources do you use? Like other organisms, you need food, air, and water. You also use resources that are needed to make everything from clothes to cars. Natural resources supply energy for automobiles and power plants. Although some natural resources are plentiful, others are not. Renewable Resources The Sun, an inexhaustible resource, provides a constant supply of heat and light. Rain fills lakes and streams with water. When plants carry out photosynthesis, they add oxygen to the air. Sunlight, water, air, and the crops shown in Figure 1 are examples of renewable resources. A renewable resource is any natural resource that is recycled or replaced constantly by nature. 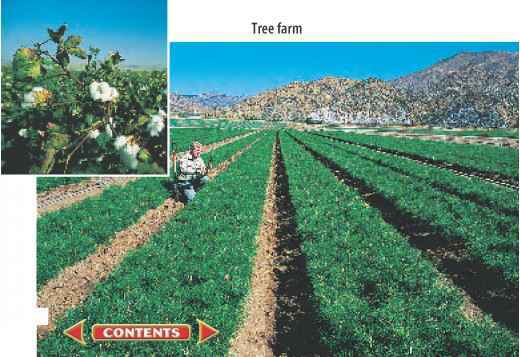 Figure 1 Cotton and wood are renewable resources. Cotton cloth is used for rugs, curtains, and clothing. A new crop of cotton can be grown every year. Wood is used for furniture, building materials, and paper. It will take 20 years for these young trees to grow large enough to harvest. Supply and Demand Even though renewable resources are recycled or replaced, they are sometimes in short supply. Rain and melted snow replace the water in streams, lakes, and reservoirs. Sometimes, there may not be enough rain or snowmelt to meet all the needs of people, plants, and animals. 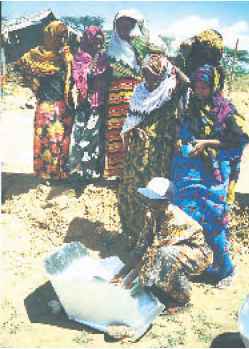 In some parts of the world, especially desert regions, water and other resources usually are scarce. Other resources can be used instead, as shown in Figure 2. Nonrenewable Resources Natural resources that are used up more quickly than they can be replaced by natural processes are nonrenewable resources. Earth's supply of nonrenewable resources is limited. You use nonrenewable resources when you take home groceries in a plastic bag, paint a wall, or travel by car. Plastics, paints, and gasoline are made from an important nonrenewable resource called petroleum, or oil. Petroleum is formed mostly from the remains of microscopic marine organisms buried in Earth's crust. It is nonrenewable because it takes hundreds of millions of years for it to form. r^jJ^nilllTmEILJ What are nonrenewable resources? Minerals and metals found in Earth's crust are nonrenewable resources. Petroleum is a mineral. So are diamonds and the graphite in pencil lead. The aluminum used to make soft-drink cans is a metal. Iron, copper, tin, gold, silver, tungsten, and uranium also are metals. 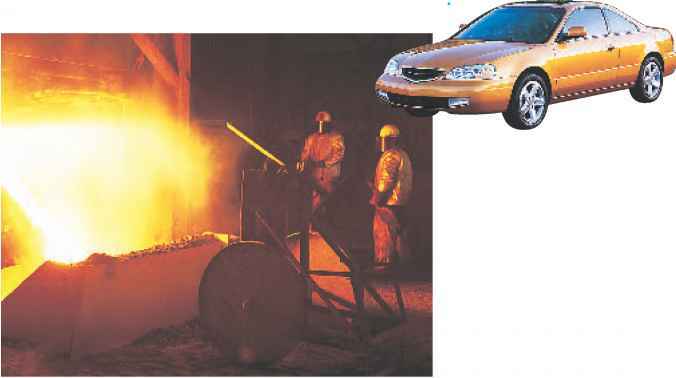 Many manufactured items, like the car shown in Figure 3, are made from nonrenewable resources. Figure 2 In parts of Africa, firewood has become scarce. People in this village now use solar energy instead of wood for cooking. Figure 3 Iron, a nonrenewable resource, is the main ingredient in steel. Steel is used to make cars, trucks, appliances, buildings, bridges, and even tires. Infer what other nonrenewable resources are used to build a car. 1. Place a chocolate-chip cookie on a paper plate. Pretend the chips are mineral deposits and the rest of the cookie is Earth's crust. 2. Use a toothpick to locate and dig up the mineral deposits. Try to disturb the land as little as possible. 3. When mining is completed, try to restore the land to its original condition. 1. How well were you able to restore the land? 2. Compare the difficulty of digging for mineral deposits found close to the surface with digging for those found deep in Earth's crust. 3. Describe environmental changes that might result from a mining operation. Coal, oil, and natural gas are nonrenewable resources that supply energy. Most of the energy you use comes from these fossil fuels, as the graph in Figure 4 shows. Fossil fuels are fuels formed in Earth's crust over hundreds of millions of years. Cars, buses, trains, and airplanes are powered by gasoline, diesel fuel, and jet fuel, which are made from oil. Coal is used in many power plants to produce electricity. Natural gas is used in manufacturing, for heating and cooking, and sometimes as a vehicle fuel. Fossil Fuel Conservation Billions of people all over the world use fossil fuels every day. Because fossil fuels are non-renewable, Earth's supply of them is limited. In the future, they may become more expensive and difficult to obtain. Also, the use of fossil fuels can lead to environmental problems. For example, mining coal can require stripping away thick layers of soil and rock, as shown in Figure 4, which destroys ecosystems. Another problem is that fossil fuels must be burned to release the energy stored in them. The burning of fossil fuels produces waste gases that cause air pollution, including smog and acid rain. For these reasons, many people suggest reducing the use of fossil fuels and finding other sources of energy. You can use simple conservation measures to help reduce fossil fuel use. Switch off the light when you leave a room and turn off the television when you're not watching it. These actions reduce your use of electricity, which often is produced in power plants that burn fossil fuels. Hundreds of millions of automobiles are in use in the United States. Riding in a car pool or taking public transportation uses fewer liters of gasoline than driving alone in a car. Walking or riding a bicycle uses even less fossil fuel. Reducing fossil fuel use has an added benefit—the less you use, the more money you save. Figure 4 Coal is a fossil fuel. It often is obtained by strip mining, which removes all the soil above the coal deposit. The soil is replaced, but it takes many years for the ecosystem to recover. Identify the resource that provided 84 percent of the energy used in the United States in 1999. Figure 5 Most power plants use turbine generators to produce electricity. In fossil fuel plants, burning fuel boils water and produces steam that turns the turbine. The turbine blades are attached to a shaft. When the blades turn, so does the shaft. Electricity flows from the coil into electrical wires. The turning shaft is connected to an electric generator. A simple generator is a coil of wire that spins inside the field of a magnet.The turbine shaft spins the coil.The spinning coil generates electricity. Another approach to reducing fossil fuel use is to develop other sources of energy. Much of the electricity used today comes from power plants that burn fossil fuels. As Figure 5 shows, electricity is generated when a rotating turbine turns a coil of wires in the magnetic field of an electric generator. Fossil-fuel power plants boil water to produce steam that turns the turbine. Alternative energy sources, including water, wind, and atomic energy can be used instead of fossil fuels to turn turbines. Also, solar cells can produce electricity using only sunlight, with no turbines at all. Some of these alternative energy sources—particularly wind and solar energy—are so plentiful they could be considered inexhaustible resources. Water Power Water is a renewable energy source that can be used to generate electricity. Hydroelectric power is electricity that is produced when the energy of falling water is used to turn the turbines of an electric generator. Hydroelectric power does not contribute to air pollution because no fuel is burned. However, it does present environmental concerns. Building a hydroelectric plant usually involves constructing a dam across a river. The dam raises the water level high enough to produce the energy required for electricity generation. Many acres behind the dam are flooded, destroying land habitats and changing part of the river into a lake. Energy Oil and natural gas are used to produce over 60 percent of the energy supply in the United States. Over half of the oil used is imported from other countries. Many scientists suggest that emissions from the burning of fossil fuels are principally responsible for global warming. In your Science Journal, write what you might do to persuade utility companies to increase their use of water, wind, and solar power. 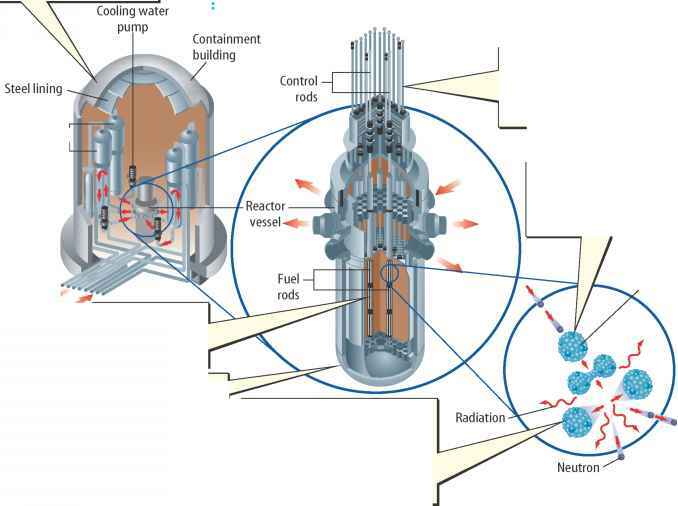 Figure 6 Nuclear power plants are designed to withstand the high energy produced by nuclear reactions. Describe how heat is produced in c nuclear reactor. 1. The containment building is made of concrete lined with steel. The reactor vessel and steam generators are housed inside. Wind Power Wind power is another renewable energy source that can be used for electricity production. Wind turns the blades of a turbine, which powers an electric generator. When winds blow at least 32 km/h, energy is produced. Wind power does not cause air pollution, but electricity can be produced only when the wind is blowing. So far, wind power accounts for only a small percentage of the electricity used worldwide. Nuclear Power Another alternative to fossil fuels makes use of the huge amounts of energy in the nuclei of atoms, as shown in Figure 6. Nuclear energy is released when billions of atomic nuclei from uranium, a radioactive element, are split apart in a nuclear fission reaction. This energy is used to produce steam that rotates the turbine blades of an electric generator. Nuclear power does not contribute to air pollution. However, uranium is a nonrenewable resource, and mining it can disrupt ecosystems. Nuclear power plants also produce radioactive wastes that can seriously harm living organisms. Some of these wastes remain radioactive for thousands of years, and their safe disposal is a problem that has not yet been solved. Accidents also are a danger. 3. Rods made of radiation-absorbing material can be raised and lowered to control the reaction. 4. A fast-moving neutron from the nucleus of a uranium atom crashes into another atom. 2. The uranium fuel rods are lowered to begin the nuclear reaction. 6. Water circulates through the steel reactor vessel to prevent overheating. 5. The collision splits the atom, releasing more neutrons, which collide with other atoms or are absorbed by control rods. The heat produced by these collisions is used to produce steam.